Most well-known today for his series of serene water lilies paintings, 19th century Impressionist Claude Monet was a groundbreaking tour de force in the development of expressive art. Throughout his long life, which spanned the years between 1840 and 1926, Monet would progress from drawing amusing caricatures of friends to capturing the elusive nuances of natural scenes in various attitudes of light and color. By striving to translate his unique perception of the natural world directly to the canvas, the artist was instrumental in forging an entirely new direction for the world of art. When the artist was 11, he attended an art-focused secondary school in his hometown of Le Havre, taking beginning drawing classes from Jacques-Francois Ochard. A few years later, Monet studied the art of the landscape from a local painter, Eugene Boudin, who also acclimated the young artist to painting in the open air so as to capture nature in the moment. Under the informal tutelage of the landscape master, Johan Jongkind, the two men became adept in the genre. One of the first Monet paintings, completed in 1858, was a realistic landscape entitled View at Rouelles, Le Havre, a lifelike sylvan scene which, at first glance, bears little resemblance to his later works. The artist's early efforts pay homage to the Realist school of art that came to dominance during his childhood. Reacting against Romanticism, Realistic artists such as Gustave Courbet focused on accuracy in depicting their subject matter, which often consisted of working-class figures and unembellished, natural scenery. 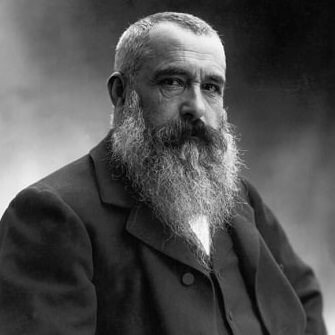 During this period from his late teens to early 20s, Monet spent time in the Louvre in Paris, where he met contemporary painters, such as Edouard Manet, who would later become colleagues. While other artists sought to improve their techniques by copying the masterworks on display in the Louvre, Monet preferred sketching what he could see out the window of the revered art museum. The artist was drafted in 1861 into Les Chasseurs d'Afrique, a light cavalry unit headed for Algeria. During his year-long tour of duty, he had only a few opportunities to paint, producing just one landscape, a few sketches and some military portraits. While none of these survived his service, he would call upon his memories of the unique quality of light in Algiers when creating future works. Upon leaving the foreign service in 1862, the artist returned to Paris to join the private studio of Charles Gleyre, a painter of historical art. He shared studio space with Pierre-Auguste Renoir, Frederique Bazille and Alfred Sisley, all of whom would later determine the future direction of art. The students would often take their easels and paints to outdoor settings and transfer their immediate impressions of the landscape onto the canvas with short, deft brushstrokes. During his tutelage at the Gleyre studio, the artist painted Woman in a Green Dress, a life-sized portrait of his future wife Camille, and Women in a Garden, for which Camille also modeled. The former painting was accepted for exhibit at the prestigious Paris Salon. The work was primarily in the Realist style, lacking the blends of bright colors and the immediacy that would define his later works. After a June 1870 wedding, Monet and his wife spent time in London where the artist painted such works as "Hyde Park." Afterward, the newlyweds dwelled for a time in the Netherlands where Monet produced several artworks, including The Windmill, Amsterdam and the luminous Zaandam. The couple returned to France late in the year to make their home in Argenteuil on the right bank of the Seine, a Paris suburb where Camille would spend virtually the rest of her life. The artist acquired a floating studio where he painted the landscape around him as well as portraits of his friend Edouard Manet and Manet's wife. By the early 1880s, Monet and his artist friends, including Paul Cezanne, Camille Pissarro, Sisley and Edgar Degas, had become disillusioned with the restrictive standards of the dominant arts organization in Paris, L'Academie des Beaus-Arts, which selected the paintings to be included in the yearly Salons. In 1873, they joined other like-minded colleagues to form their own arts organization, "Societe Anonyme Coopérative des Artistes Peintres, Sculpteurs et Graveurs," or the Cooperative and Anonymous Association of Painters, Sculptors and Engravers. The group organized its first exhibit, which included the work of 30 artists, in the spring of 1874. 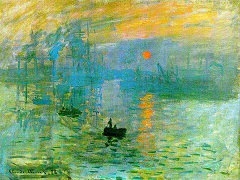 Monet opted to show his 1872 painting, Impression Sunrise, which proved to be a fateful decision. 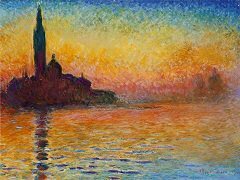 One of the art critics reviewing the exhibit coined the term "Impressionism" as a derisive jest after viewing "Impression Sunrise" and similarly rendered works on display, claiming that the paintings were amateurish and unfinished. The artists embraced the new title for their movement, and thereafter, identified themselves as Impressionists. Once the movement had a name and a reputation, however dubious, Monet went on the create some of his most brilliant works of art, such as Madame Monet and Child, which he completed in 1875, a scene resplendent with and color and life. While carrying their second child, Camille Monet contracted tuberculosis, and weakened by childbirth, died in 1879. 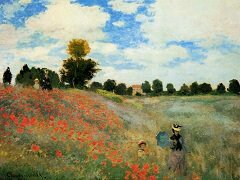 The painting, Camille on Her Deathbed, is Monet's final tribute to his wife, a figure covered in flower blossoms and feathery brush strokes, her face bathed in light. Among the artist's works in the time following his loss is The Ice Drift Series, a group of a dozen paintings depicting the melting ice floes on the River Seine. Muted colors, mist-saturated settings, denuded trees and frozen landscapes reflect the starkness of the artist's vision as he immersed himself in mourning. The artist was becoming increasingly enamored with the insight that the same landscape underwent alterations at different times of day as the sunlight changed. He painted the same scene repeatedly to capture these nuances on canvas. This idea informed his "Ice Drift Series," his Haystack paintings of the mid-1880s and 1990s, and his stunning Poplars series of the 1890s. In 1892 and 1893, the artist camped out in a rented room that overlooked the Rouen Cathedral to work on a several canvases at once, each devoted to a different time of day, to create intensive studies of light and shadow. During this middle period in his artistic development, Monet's artworks moved toward abstraction, although the subjects were still recognizable, for the most part. He experimented with paint to create not only more depth of color but also to add texture to the surface of the canvas. Known for his innovative brushwork, the artist utilized his signature short strokes and unadulterated hues to encapsulate momentary glimpses of the effect of light on perspective. 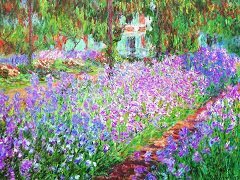 The artist and his second wife, Alice, had moved their family to the hamlet of Giverny where they bought a home with property in 1890. Monet set to work to create a private haven where he would produce some of his most well-loved works over the final decades of his life. Flower gardens and a lily pond with a picturesque Japanese bridge provided the landscapes that the artist would paint over and over again as the century began. 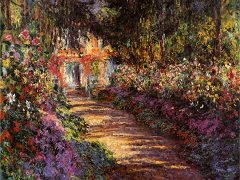 He would later state that the Giverny gardens constituted his greatest work of art. 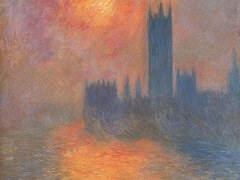 During his travels in the first decade of the 20th century, the artist painted a series of the Houses of Parliament in the Palace of Westminster, which rises from the fog or towers over sun-gilded waters at sunset. During the same period, the artist produced several paintings in a study of Waterloo Bridge and the Thames in various attitudes of light and fog. He also visited the Mediterranean region and Madrid in the early 1900s. 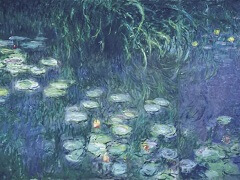 His chef d'oeuvre, however, was actually waiting for him in his own back yard where he produced his series of the water lily pond paintings, which consists of approximately 300 canvases in total, 40 of them in large format. The artist had painted his first renditions in the 1890s but produced the majority of the works during the final two decades of his life. His early paintings of his lily pond included the conventional spatial boundaries of water, surrounding land and horizon, but as he progressed through these works, such boundaries began to merge until finally, the boundless pond became the universe, its scope immeasurable and defined exclusively by light. After losing both his second wife, Alice, and his eldest son, Jean, in 1911 and 1914 respectively, the artist sought consolation by embarking upon a great new work, a series of massive Water Lilies panels. On Armistice Day in 1918, he arranged to donate the resulting murals to the French state for installation in La Musee de l'Orangerie. Ever the perfectionist, the artist revised and reworked this series repeatedly over the ensuing years until their final installation in 1927 in two ovoid rooms of the artist's own design. The opus includes eight room-sized panels, each more than six feet tall, with lengths designed to fit the space. Andre Masson would christen these rooms "The Sistine Chapel of Impressionism" in a 1952 review. 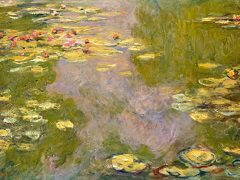 Just like Shakespeare on literature, and Sigmund Freud on psychology, Monet's impact on modern art is tremendous. Monet was among the most influential artists of any era, and his unique color palette, vision and conformation would make a lasting impact on future fine art. Many artists have been influenced by Monet, whose techniques inspired Impressionists and Post-Impressionists such as Vincent van Gogh. In terms of form and scale, the artist's work directly influenced such Abstract Expressionists as Jackson Pollock and Mark Rothko. Popular artist Andy Warhol reflected the Monet influence in his multiple renditions of a single subject. Claude Monet also laid some of the groundwork for the Minimalist movement of the 1960s. Still extremely popular in his own right, the artist continues to the present day to define both the public's appreciation of art and the perception of beauty in its purest form.